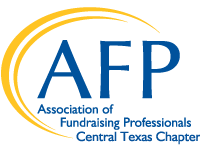 AFP Central Texas is currently accepting applications for the 2019 Chamberlain Scholarship. This scholarship provides for one member of our chapter to attend the AFP International Conference (AFP ICON) provided they meet the scholarship criteria. Selected recipient must not have previously attended an AFP International Conference to be eligible for this scholarship. Chamberlain scholarship funds are only able to cover registration for AFP ICON to be held on March 31 - April 2, 2019 in San Antonio, Texas. All transportation fees, lodging fees, and incidental expenses are the responsibility of the scholarship recipient. Please submit the 2018 Chamberlain Scholarship application to Jenny Peel, Chapter President. Applications are due no later than September 27, 2018. All applications received will be reviewed by our scholarship committee. Recipient will be notified by committee prior to be being announced during our October 25, 2018 member education meeting.